Four-time first team All-American Jillian Kraus led UCLA to four NCAA national championships–the first in 2005, the last in 2008. She scored 178 goals over four Bruin seasons, the fourth-highest career total goals in the program history. The 5’9” defender from Tustin was a finalist for the 2008 Peter J. Cutino Award, presented annually to the outstanding U.S. female and male collegiate water polo players. She was named to the All-Mountain Pacific Sports Federation Academic Team three straight years. She was also MPSF “co-player of the year” in 2008. Kraus starred for Foothill High School and was team captain and MVP. She earned All-CIF and All-Sea View League water polo honors 2001-2004, and was recognized as a scholar-athlete all four years. While at Foothill, she competed for the SoCal club team and the USA National Youth Team. 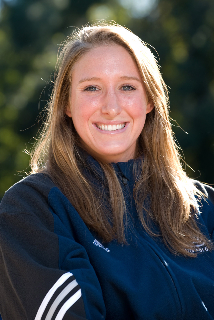 Jillian was also Foothill’s swim team captain in 2003 and an All-Sea View League first-team swimmer in 2004. Jillian qualified for the CIF Division 1 swim championships and finals in each of her four high school years.